North Korea is reportedly expanding a key nuclear missile manufacturing facility, less than a month after Kim Jong Un’s summit with Trump, where he agreed to move toward denuclearization. Satellite images showing the nuclear facility expansion come as no surprise after Trump and Kim’s agreement was widely criticized for being vague. However, it was a surprise to Trump, who strutted back into the U.S. after the summit bragging. The observed activity appears inconsistent with a North Korean intent to abandon its nuclear weapons programs. There seems little reason to continue expansion plans if the regime intended to dismantle them as would be required under a denuclearization agreement. These new images come after 38North revealed last week that North Korea was also making improvements on its main nuclear research facility, Yongbyon. On Saturday, unnamed U.S. intelligence officials concluded that North Korea has no intention of surrendering its nuclear capabilities but instead, plans to “conceal the number of weapons it has and secret facilities.” It wont be the first time North Korea has hidden nuclear production from the U.S. In 2010, U.S. intelligence agencies became aware of an underground uranium enrichment site called Kangson. Basically, North Korea is continuing to lie to the U.S. as it always has, despite Trump’s hopes that he could smooth-talk them into denuclearization. 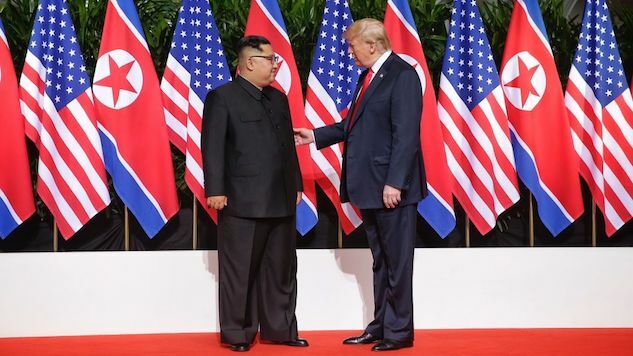 However, while the U.S. cancels key military exercises with South Korea upon the request of Kim, North Korea is expanding and improving their nuclear forces. If they have the strategic decision already made to do that and they are cooperative, we can move very quickly. And it is to North Korea’s advantage to dismantle very quickly. Then the elimination of sanctions, aid by South Korea and Japan and others can all begin to flower. ... very well aware of North Korea’s patterns of behavior over decades of negotiating with the United States. We know exactly what the risks are, of them using negotiations to drag out the length of time they have to continue their nuclear, chemical, biological weapons programs, ballistic missiles. The president would like to see these discussions move promptly to get a resolution.